Satellite images show a hotspot at the summit as well. VSI has decreased the alert level from 3 (Siaga, Alert) (since 8 August 2011) back to 2 (Waspada, watch). No lava emissions/ejections have been observed since 7 July and seismic actity has been decreasing over the past weeks. No hot spot is visible on satellite imagery. An eruption has occurred this morning. VAAC Darwin signaled a volcanic ash cloud reaching 14,000 ft (4.3 km) altitude and extending 25 nautical miles to the WNW. 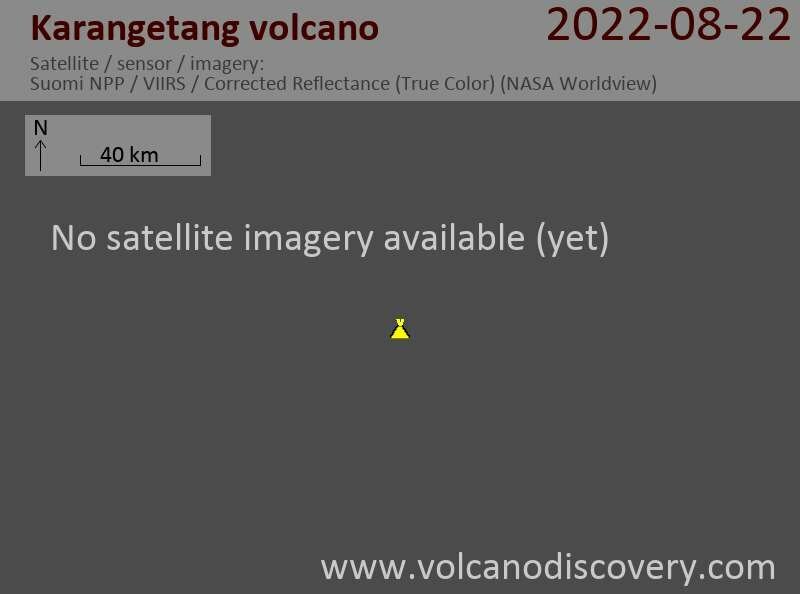 VSI maintains the volcano on yellow alert (since 2011). According to a news article, pahoehoe lava flows traveled 150 m and rock avalanches traveled 2 km down the flanks on that same day. A thermal hot spot is visible at the summit and suggests that some activity continues. Thermal anomalies are becoming more frequent at Karangetang since mid December after being absent during the month before. No ash emissions have been observed, but it is likely that the volcano has started to produce some minor activity at the summit dome.